Since I cannot stop fantasizing about cookies lately, I decided to try out this recipe for Chewy Chocolate Peanut Butter Cookies, and I am SO glad I did! The original version uses regular, chunky peanut butter, but I decided to use my favorite peanut butter substitute – Better’n Peanut Butter, so that I could eat more cookies for less Points. It worked out really well, and the end result was a deliciously sweet and satisfying treat that will for sure be on my tray of Chrismukkah Cookies this year! I use the term Chrismukkah because I celebrate Christmas and Hanukkah, which means more presents and yummy food!! Each cookie is just 2 Points, which isn’t bad considering how rich and flavorful they are. I’m satisfied with eating just two or three of them, and I don’t go overboard. So if you are looking for another great Christmas cookie that won’t blow all your Weight Watchers Points, then this Chewy Chocolate Peanut Butter Cookies Recipe is a must try. I mean, really, does it get any better than peanut butter and chocolate together in a moist and chewy cookie? No, it doesn’t. So get yourself to the kitchen pronto and whip up some of these low calorie Christmas cookies ASAP! 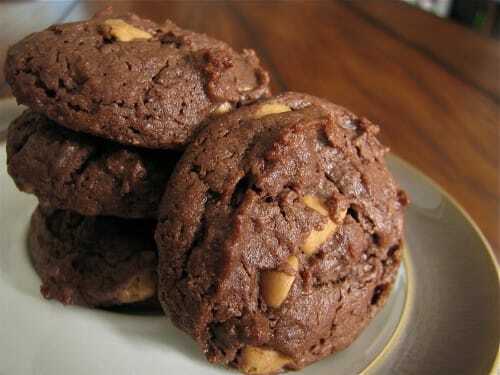 Get your chocolate-peanut butter craving satisfied quickly, with these moist and chewy Chocolate Peanut Butter Cookies. Sweet and rich, they pack a big peanut butter punch for just 2 Points. Beat Better n’ Peanut Butter, oil, brown sugar and granulated sugar in a large bowl with an electric mixer on medium speed until the sugars are blended. Beat in egg substitute, yogurt and vanilla until combined. Whisk flour, cocoa, oats, baking soda and salt in a medium bowl. With the mixer on low speed, gradually add the dry ingredients to the peanut butter mixture until blended. (It will be sticky.) Stir in chocolate and peanut butter chips. Using a small cookie scoop or slightly rounded tablespoons of dough, place cookies 2 inches apart on un-greased cookie sheets. Dip the bottom of a glass in water and then in Turbinado sugar. Use the sugared glass to flatten the cookies slightly, leaving a thin layer of sugar on top, re-wetting the glass as needed. Cool on the baking sheet for 2 minutes before transferring to a wire rack to cool. Turbinado sugar is a coarse looking sugar and is light brown in color. Find it in the natural-foods section of large supermarkets or at natural-foods stores. Just made these cookies and agree with the previous comments. When made as directed, the batter is more liquidy, like a cake batter. I added another cup of flour to the recipe, and they came out more like cookies, but still not like pictured. Can you double check the ingredient amounts and confirm that they are listed correctly? I have made these 3 times and every time they won’t come off of the parchment lined cookie sheet. They are very gooey and almost undercooked looking. What sm I doing wrong? Can you use an egg instead of the substitute? I used regular yogurt instead of greek, and PB2 instead of Better’n Peanut Butter. Cookies came out like the consistency of a cupcake top. Still satisfies my need for chocolate. Using a heaping Tbsp to put onto the cookie tray, I only got 28 cookies, not 36…I should have made them smaller. What if you don’t have Better’n peanut butter? Does it change the point value significantly? Yes, if use regular peanut butter, the fat and calorie content significantly increases, thus increasing the Points Plus value. Delicious but I couldn’t get the cookies off the ungreased sheet in one piece. I finally gave up and sprayed a pyrex baking dish with canola oil and baked them brownie style.